Dubai: Got a ready apartment in Sports City? If so, then there is a better chance of selling that unit, according to the transaction numbers for Dubai’s freehold space over the first seven months. In fact, Sports City is the sole apartment cluster to record a net gain in sales compared with a year ago — something achieved by selling 581 ready units, more than the 467 recorded same period last year. The other neighbourhood showing marked signs of renewed interest for completed projects is the Downtown area, where 344 units were sold in the first seven months compared to 365 last year, according to data released by GCP-Reidin. In all, 7,205 ready apartments changed hands in January to July period across Dubai, not too far removed from the 7,649 sold last year. Among ready properties, an uptick in demand is not confined to apartment dwellings. The Arabian Ranches, Springs and Meadows communities recorded “green shoots” of recovery in transaction numbers. This is despite new communities coming up close to these locations, some of them priced quite competitively to what Arabian Ranches and Springs are commanding these days, market sources say. It could be that investors in Arabian Ranches or Springs might have countered by dropping their asking prices on their properties. Whatever be the reason, there is now a slow build-up in buyer interest for pricier homes, particularly villas. Jumeirah Islands is another beneficiary from this. “The upmarket villa space had borne the brunt of the correction from mid-2014, and the uptick now suggests interest from end users as well as investors,” said Lakhani. But in the off-plan market, demand remains downright sluggish. Just over 10,500 off-plan units were sold in Dubai against the 14,330 racked up in the first seven months of 2017. Last month accounted for 1,224 units, far removed from the 2,006 recorded in May. 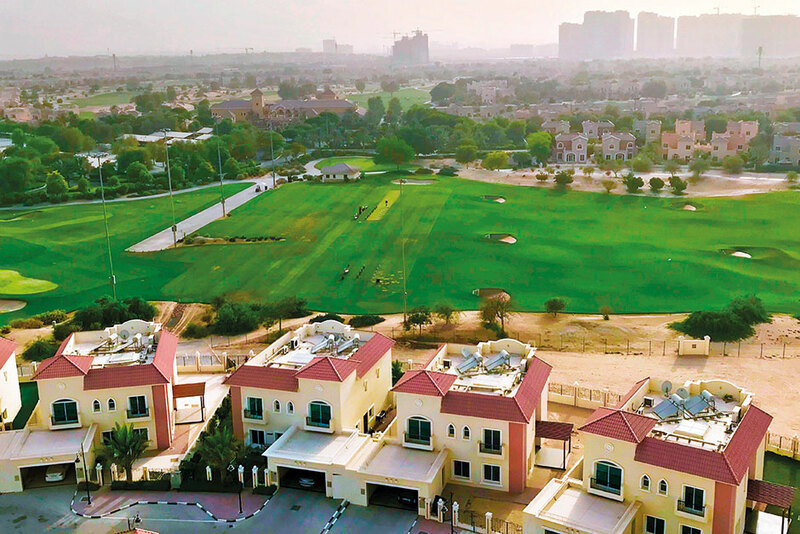 Jumeirah Village Circle (JVC) accounted for the highest number of off-plan sales, toting up 999 units based on the GCP-Reidin data. Even then, that is 24 per cent off from the January-July 2017 period. The sluggishness is “perhaps exaggerated somewhat due to the summer months on the one hand, and the lag in the recording of registrations on the other,” Lakhani added. In value terms, the first seven months generated an estimated Dh14.05 billion in off-plan sales, but well off the Dh20 billion-plus that had gone into the sellers’ kitty in 2017. All through the last 12 months, there was one clear trend running through Dubai’s freehold transaction numbers — demand for high-end property is on the mend. It is no longer just a handful of villas on Emirates Hills or the Palm going for seven-digit sums. It is now starting to run much deeper than that. For confirmation, just look to the “spreads”, the price differential between what a standard property is going for and what a high-end home commands. If the spread gets wider, it means demand for high-end homes is on the rise. And vice versa. “An analysis of the spreads between prime and general properties reveals a compression after peaking in 2014,” says a new report put out by GCP-Reidin. “In the apartment segment, the spread narrowed by Dh340 per square foot, while in the villa space by Dh265 psf. In this cycle, the demand of affordable housing has been higher, consequently narrowing the spread between both segments.